Word on the street is that Piranha Bytes may once again end up working on the Gothic series when it's finished developing Risen 2. German developer Piranha Bytes is best known as the creator of the Gothic RPG series, in large part because it was the only thing the studio ever did prior to its 2007 split with publisher JoWood. Piranha Bytes went on to develop Risen, a 2009 release that fared reasonably well on the PC but scored poorly on the Xbox 360, while the Gothic franchise was handed to a new studio, Spellbound Entertainment, resulting in Arcania: Gothic 4. That was a bit more of a train wreck, amassing a Metacritic score of just 63. Fans will probably be happy to hear, then, that Piranha Bytes could possibly get the franchise back - maybe. In an interview with Czech fan site Gothicz.net, co-founder and project director Michael Hoge said the agreement that saw JoWood get the rights to the IP isn't actually permanent. "We get the rights to Gothic back when we have finished Risen 2," he said. "Why? Because we did only sell them to our ex-publisher for a certain amount of time ;)"
But in a countervailing opinion posted on the WorldofPlayers.de forum [Google translated], Piranha Bytes Managing Director Michael RÃ¼ve wrote that Hoge "isn't a lawyer" and that his comments should be taken with a grain of salt. "For me there is no need to comment on our contractual position with JoWood. 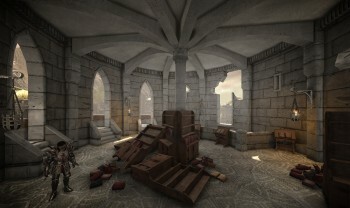 The fact that we are not currently working on Gothic [is] well known," he wrote. "JoWood currently has other worries. Speculation about the future [of] Risen 2 are just that - speculation." Whatever happens, if anything, it won't be for awhile: Piranha Bytes currently has its hands full with Risen 2, which is slated to come out later this year, while a stand-alone expansion to Arcania: Gothic 4 called Fall of Setarrif is in the works at Spellbound.